I have made a big and colourful puff for my nephew. He is going to love it! And I really love your mini quilt! I made a little fabric basket for a swap which I am very proud of. I'll be checking out your free motion tips! I love the christmas dresden pillow I made the best! Favourite thing I made this year was a blouse. It was the first time I finished an item made from a flimsy material and let me tell you, rotary cutter made all the difference. My favourite thing I made this year was a baby quilt for my godson. Maybe not very professional, but I made it with all my love. Finally finished my Beach Quilt this year and love how it came out. It was all paper pieced and I embellished with buttons, fusible accessories & my friend quilted in pink flamingos!!! It hangs in a place of honor in our beach-themed family room. Love your little Christmas mini!!! What a lovely mini :) Thanks for the heads up re the give away on Sew Mama Sew - I hadn't visited there for a while and this was a great reminder! My favourite project this year was a messenger bag I designed and made for myself - I use it everyday. This is really cute, Vick! My favorite thing I've made this year is probably my new advent calendar. This year I am proud of all my work. This past year I just started quilting. so every time I finished a project it was a little better than the last, so I am proud of them all. That is one seriously cute mini! I love it and I'm totally crossing my fingers! Thanks for a great giveaway. My favorite thing I've made this year is probably my snowball quilt. It was a lot of fun to do the quilting. love this adorable mini quilt!! Oh gosh...it has been a long year and I have made MANY things..don't think I could pick just one favorite!! Most of the things I make are for birthday gifts or other people so anything that makes someone smile is my favorite :) Thanks for the chance...I may be back for some FMQ tips...it really scares me!! my favorite thing that i made this year was a little hooded sweatshirt for my son - he's already too big for it, but it was my first time tackling sleeves. Cute mini. Thanks for the chance! I can't think of one project, I've just been working on actually finishing projects and I'm proud to say that I'm getting better. A charity quilt for a dear friend battling cancer. My favorite thing I made this year was my very first quilt! I was so proud of myself! My favorite thing I made this year is the Dead Simple Quilt. My favorite things I have made this year are some darling little girl skirts. Having 4 boys, the need to sew pink, ruffles or skirts doesn't come around very often! I made one for the little girl I babysit, and then for a friends 3 daughters. They asked for and are getting their daddy home from Army training just in time for Christmas. That was all this family could afford this year so I will be secretly dropping these tiny skirts, matching shirts and bows off for the kids to open for Christmas from Santa. Wish I could do more, but I hope this will make them happy. I made a super cute handbag for a friend, this year. Thaanks for the chance ! What an adorable quilt! My favorite project this year was my Star Struck quilt. My favorite thing that I made this year are glitter houses to match my unique Christmas palette of pink, turquoise, and silver. That is so sweet. I think I enjoyed making my granddaughter's Easter dress most this year. My favorite thing I made this year was probably a Memorial Tree pendant for a woman I know. Our best friend (her son) passed away suddenly and about ten years ago, her other son passed away. I made her a Tree pendant with both of their birthstones in it together. I wanted to her to have a way to keep them both together close to her heart. Simply cute! I quilt for my darling granddaughter this year would have to be my favorite because it is the first one I have finished!!! Ha! Ahhh, gorgeous! I love it! I just started trying to sew in November but the favorite thing I have made so far has been my daughter's Christmas outfit...or her Christmas PJ's. That is such a sweet little quilt! My favorite project this year was a guest quilt for my sister's wedding. My favorite project this year was the Pottery Barn knockoff quilt I made. Reds, greens, beiges cut into strips.. yummy! Thanks for the giveway! Love the tree! A cute backpack for my 2 year old. My favorite thing I made this year has been the necklaces that I will be giving away to family and friends for Christmas!! My favorite thing this year? Hmmm I think it would be the matching knitted gnome hats I made for three siblings. I love the wonkiness of your mini-quilt. It's pretty gosh darn cute. I completed my 1st quilt last month and am super happy about it. I mean, it's not perfect, but I love it. It went ot a good home. What a great mini quilt, I love it! Thank you for the chance. My favorite thing I made this year might have to be wonky stripe table runners I designed for my Etsy shop. They came together exactly as I'd envisioned, I love when that happens! A nice fabric rosette necklace and a chunky scarf. The one thing I am happy about is the hoodie bag I did to save my daughters favorite anime hoodie. Thank you for such a great giveaway! I did a lot of "new to me" things this year, but my favourite was a paper pieced panda! Finally, I had success at pp. Thanks for a great giveaway. So cute! That is such a cute little quilt! My favorite project? I've done several. But I put together these little books with index cards and vintage graphics and little bits of fabrics and laces. It was fun to do and very inexpensive. And the project came out very cute! The favourite thing I made this year was a big mess... yep, I've moved house twice & that equals a big mess! I look forward to unpacking & actually making stuff next year! I am proud of my Almost Solid (pattern by Kaye England) quilt that I made - used my new sewing machine for embroidered and straight quilting and it turned out pretty - all scraps. I made my granddaughter a Merry Grinchmas pillowcase dress that is so cute! Thanks for the giveaway! Favorite thing this year was a bag for myself - it's not often that I make something selfishly, and I love the bag! My favorite thing was a dress for my daughter. My favorite thing I made this year is the quilt I did free motion quilting on for the first time!! Not perfect but something I have wanted to try for a long time. My 4 jean quilts that I made for me kids. Way proud of those! I made an awesome quilt for my daughter this year from the Authentic line. It's on her bed in her university dorm room so she is reminded of home. My daughter's ice skating dress. Until a couple of years ago I was afraid to try. Now I enjoy it! I love the little owl ornaments I made for my friends. I am looking forward to the FMQ! i just finished making my daughter a Ruby Gloom doll. It urned out super cute! thanks for the chance! My favorite thing I made this year was a quilted bag. It was fun because I made up my own pattern! I made a number of quilts this year. The group I made for Gugulethu, South Africa was the most satisfying. This is lovely! The best thing I made this year was a chocolate cake, from scratch. First time I ever made one, not from a box mix! hah! Love your cute mini quilt. Perfect to add a bit of color and festive pretty to our home. Thanks! The top is pieced, but the quilting is still not finished . . . I LOVE the Christmas quilt I made this year. Wish I had gotten my act together to finish it before Christmas this year, but I don't think it's going to happen. My favorite thing I've made this year is the FQS Mystery BOM Christmas quilt using Twelve Days of Christmas fabric by Kate Spain. My favorite creations this year are some patch-work place mats from a tutorial on made and earbud earphone holders. Great gifts! i learnt to crochet at the end of last year so this year I made a my 2 year a blanket to take with her to hospital, my 10 year old a chunky one to take on a winter school trip and I am currently crocheting the squares of my 5 year old sons together... I love that they have all watched them being made and chose the colours. One day i'll see them being used on their children... bliss!! A modern quilt take on a seashell. Now if only I had more time to quilt! Everything I made was my favourite thing, I could not really pick one. Love that little mini, thanks for the giveaway. I am in love with a cowl I made for myself. I'm almost always chilly when I'm awake, so I love to have it snuggled around my neck and shoulders. Love the mini-quilt! I really need some Christmas decor!! The favourite thing I made this year is probably a little ruffled skirt for my daughter - the fabric choices and pattern just turned out perfectly. Gorgeous mini quilt! For me, probably the beard beanie for my brother's birthday (knitting) but with fabric it would be the luggage tage I made for the intrepid explorers among my friends! I made my niece a new dress and managed to follow a pattern for the first time. My favorite thing I made this year.. hmmm.. I have my first quilt almost done for my son. It's pretty awesome, just needs some binding.. which I keep putting off because I am no good at it! lol. I also crocheted some hats I like a lot! I made some summer shirts for my second oldest daughter this year. I did not use a pattern so the ideas were all from my head and she had to "model" often for me. They turned out great and were so much fun. I really like the details in your mini quilt. How fun! I finally finished a quilt I started last year. I had SO much trouble with it that I thought many times about giving up. But determination won out and I actually finished it! Hurray! My favorite thing is my dresden plate quilt. Thanks for the giveaway. I love that this is small project, not too overwhelming! So far I've finished a new tree skirt with a tote and pillows coming up. Your mini quilt is adorable. I just finished a bunny baby quilt for my new little nephew. my favorite thing is my FIRST quilt, because I know it's the starts of a lifetime of quilting for me! I did knit some awesome things too. ; ) thanks for the chance to win! I LOVE your mini quilt. I want to make a tree skirt like that for next year!!! The pinwheel quilt top for my daughter. What a nice mini quilt! Thank for offering it. My favorite thing that I made this past year would be either some embroidery peices that I did or a painted peg family. I finished up my first large quilt a week or so ago...I'm so proud of it! Great giveaway...I LOVE your Xmas mini! I have mostly been making fabric postcards this year for the Yahoo group TradingFabricPostcards. We decided to do an Alphabet theme and make a postcard to swap with each letter of the alphabet. We finished the last two this month. It was a great swap and I loved it because I was really inspired to think up something completely unexpected so I could surprise my swap partner. For example for the letter "I" I used the word Incognito and made a postcard of the glasses with the fake eyebrows, nose & mustache!! Your quiltie is ever so cute. Thanks for the great giveaway! My fav this year is a baby quilt I made for the sweet baby girl I am expecting in March! my favorite thing i made so far is a crocheted garland. I made a really difficult dress and was very proud. Thanks for the giveaway. a lap quilt that my bro won in our family Yankee Swap. My favorite peoject I made this year is the shawl that I knit to keep my Mother-in-law warm. I love your quilt. One year I made counted cross stitch gifts for all family members. Love your mini quilt. I made two quilts for my baby nieces this year! I made a stuffed owl for my 2 year old that he is going to go nuts over! I managed to knit a scarf. I hadn't knitted for years!AriadnefromGreece! Thanks so much for this chance and excuse my english please. I designed a quilt (a really simple quilt but still) and made it and I was proud!! Thanks for the giveaway + merry Xmas! I made mug rugs - so fun. I made a quilt for my nephew and his bride for a wedding gift. i just started quilting this past summer, so the fact that i made my first two baby quilts is a big deal. it was incredibly rewarding to finish them and give them to loved ones. thanks for the wonderful opportunity! your mini quilt is beautiful! have a lovely day. I love the sun hat that I made. It was the first sewing pattern I created and it turned out perfectly! My favorite thing I made this year was a lace shawl that I knit for my sister-in-law. My favorite was my Generations Quilt, made with blocks my grandmother made. I finished it and gave it to my mother for her birthday... Super-emotional and extremely special. I made a Zentangle Inspired Art piece for my husband for his birthday with his name in it. Favorite Thing...........hmmm..........probably the throw quilt I made for my twin. I have your Focus on Free Motion Quilting button on my blog. i made a baby quilt for my soon to be born little nephew Jasper Pete. Hopefully he will decide to join us any day now (he is a week overdue). I made a Princess Buttercup costume this year for Halloween. I was pretty impressed. I think that the best thing I made this year was the quilt for a Wounded Warrior. It went to a Marine who was seriously wounded in Iraq. My now deceased husband was a career Marine, who lived through two tours in Vietnam and other places. I am proud of our servicemen and the great sacrifice they all make to keep this country free. My favorite things I made this year were the doll quilts for the DQ swap on the quilting board. I joined last spring and I have so enjoyed making the DQs each month, exchanging them and getting to meet people from around the world! Thanks for the giveaway! Thank you for the chance to win such a wonderful prize. My favorite thing I made this year were some dump truck cookies. A friend asked me to make them for her son's birthday. They turned out really cute! I love your mini quilt. I made a wall hanging this year which included all the flowers I transplanted from my grandmother's garden to mine. Thisis so adorable. I am most proud of the Luke Skywalker and Yoda costumes I made for my 4- and 7- year old nephews at Halloween. They were absolutely the most amazing Jedi and it won me so many Favorite Aunt points!! I made a shawl for a friend battling breast cancer. A blankie for my son. I made a sweet baby quilt for new baby girl. I can't wait to see what you have to say about free motion quilting next month! LOVE this mini quilt. My favorite thing was the Mother of the bride dress I made to wear to my daughter's wedding. A crayon roll was a nice thing I made this year, sewing wise. I also made a cute tiny newborn kimono... it fit for about 2 weeks! I love this,so lovely,thanks for chance to win it.I crochet so I made so many ornaments this days,but also hat,few mittens,baby booties,enjoy it so much. my favorite thing is a pair of pants for my son. My favourite is the 241 tote bag from Noodlehead! I shall return for the FMQ!! I made a bag for myself. it doesnt have to do with sewing, but i made a wreath out of plastic grocery bags. it turned out so pretty too. I love quilting and have made a few, currently one for me for a change...lol..however i think the most favourite thing this year is my new socks!! my first pair, have been wanting to learn to knit socks for ages and finally conquered it! What a great mini..love it. I would say my favourite thing I made this year would be the rag quilt for a new nephew. I kept putting off making it, but when attempted it it was a breeze and a great accomplishment. Your mini-quilt is lovely. I made three Easter dresses for my girls that I thought were darling. Your mini-quilt is darling. So inspiring! Thanks for the giveaway opportunity. Your mini quilt is cute. I think one of my favorite things I made was a Christmas ornament for my mother. Thanks for the giveaway! I made some really cute ornaments this year. Thanks for the contest. I made a paper-pieced giraffe. It was with some fabric you gave me. I'm kind new at making stuff but I made some cute yoyo candlemats. The favorite thing I made was a baby blanket for my new granddaughter. It's made of vintage chenille with flannel on the back....super cozy! The thing I'm most pleased with is a turquoise and brown afghan I crocheted for our newborn son. The thing I've had the most compliments on is his car seat cover. I'm looking forward to the free motion quilting event. I really need some instruction there! Made a quilt for my grandma. I used a sheet from her father's house as the back....it was really special! This year I recovered an infant carseat for my baby. I was soooo anxious about it, but looking back it is my favorite project from the year. I made a Dr. Seuss quilt for a friend's little baby and it hurt to give it away! I made a new row by row quilt (my own design) with Pam Kitty Morning's new fabric. Thanks for hosting a giveaway! My favorite thing I've made this year was a quilt I made for friends that got married, it was just simple white with strips from a fat quarter bundle I loved it so much I almost didn't give it away! The favorite thing I made this year I literally put the final stitch on 2 minutes ago. Its a candy corn plush for my husband, since he loves the stuff so much. I made a sailboat quilt for my new baby, so special. My favorite thing I made this year was a T shirt quilt for my son. I made a fabric activity tote with fun schoolish fabrics for homeschool supplies. It has tons of pockets for organizing and it turned out cute and functional! I made a whole lot of bee blocks, pjs and mini quilts this year and had a blast--but my favorite was making my dad some flannel pjs which he is still raving about months later. My favourite project is a quilt from a kit made with happy by me &my sister, currently hand quilting it and loving it more with every stitch. Love your mini quilt. My favorite thing is the mug rug that I made for my Mom. Just seeing the smile that it brought to her face was priceless. My favorite projects this year have been making themed mug rugs for my son. My fave thing from this year was my first ever quilt (a mini quilt for my daughter's dolls). Love that mini-quilt. 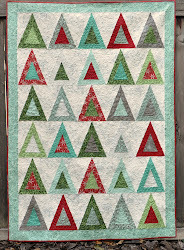 I know next to nada about quilting but pretty blocks like that make me want to try it. Perhaps I will! The most fun thing I've made all year is a Rapunzel crown/braid for my 3 year old granddaughter. It's a Christmas gift so she hasn't seen it yet. It wasn't difficult at all but the pleasure it will bring her (I hope!) is priceless. I am most proud of a bridesmaids dress I made to wear at my friends wedding a few months ago. I am new to sewing. I knitted a mini elephant. The pattern is called elephante on Ravelry and it is the cutest thing I have made this year. Your mini quilt is so amazing!! What a great giveaway!! Thanks so much for the chance!! 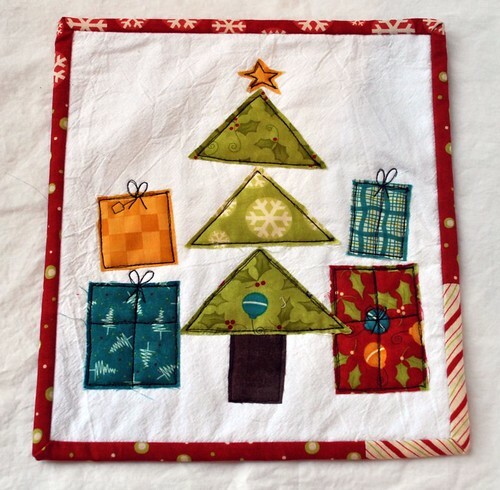 I participated in my first swap this year--the modern christmas tablerunner swap run by Susan at Canadian Abroad--and I think the tablerunner I did with wonky trees and houses is my big accomplishment for the year. It's the first tablerunner I've done and really the first big project. Hmm... well that's funny. I'm not sure I've actually finished much recently... I did make some new ornaments for the tree and since they are finished I guess they must count as my favorites. My favorite was a vintage cowboy baby quilt. Loved how it turned out. The favorite thing I made this year was my son's Vroom-Vroom PJ's from an Ottobre pattern. All the pieces made it a labor of love and it warms my heart every time he wears them. I really need those free motion lessons. I'm going to be following! I am following you~ I love your items!